: Standard Hex Nuts, Lock Nuts, Slotted Nuts, Castle Nuts, Fine Pitch Nuts (Special), Serrated Nuts, Left-Hand Nuts, Self Clinch Nuts etc. Bolts : Standard Hex Head Bolts (Full Thread/Half Thread), Carriage Bolts, U-Bolts, J Bolts, Foundation Bolts, Step Bolts, Eye Bolts etc. Washers : Plain Washers, Spring Washers, Tapper Washers, Star Lock Washers, Disc Washers, Multi Teeth Lock Washers, Bearing Washers, Wave Washers, Fan Disc Washers, Contact Washers, Conical Washers, Belleville Washers etc. Studs : Stud Bolts :- As Per ASTM & Fully Threaded Studs, Partly Threaded Studs, Studs as per IS 1862 Type 1,2,3 etc,Tie Rods & Self Clinch Studs. Screws : Allen Cap Screws, Grub Screw, Machine Screw in Cheese Head, CSK Head, Round Head, Pan Head, Mushroom Head, Self Tapping, Sheet Metal, Trilobular Tap Tite, Wood Screw etc. 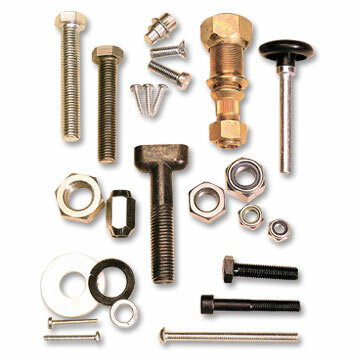 Other Fasteners : High Tensile High Strength Structural Bolts/ Nuts, Anchor Fastener, Expansion Fastener, Dowel Pin, Spring Dowel Sleeve, E-Clips, Circlips, Tapper Pins and others.All items as per Drawing or Specifications.